A few months ago I took a quick jaunt to Carlisle to see the Pennsylvania Civil War Sesquicentennial roadshow. I was heartily impressed with the quality of interpretation and exhibit design. For a rolling exhibit which needs to fold in upon itself, it was very rich and powerful. Jared Frederick, proprietor of History Matters had a nice roundup of what that exhibit comprises. After the great experience with Pennsylvania's traveling offering, I was excited to see what Virginia, the heart of the Civil War in the East, had to offer. That's why Michael Lynch's preemptive criticism of the exhibit actually excited me. I believe that coming close to a recovered experience, trying to see the world through a historical actor's eyes, is not only possible but the ultimate opportunity for any historical interpreter to offer their visitors. So how did Virginia's HistoryMobile stack up to Pennsylvania's? Not very well in my estimation. The exhibit was well intentioned. But the hokey execution of the first gallery cast a long shadow on the rest of the experience. The gallery was a small, dark room. Soldiers voices pipe from the darkness, discussing the coming fight. 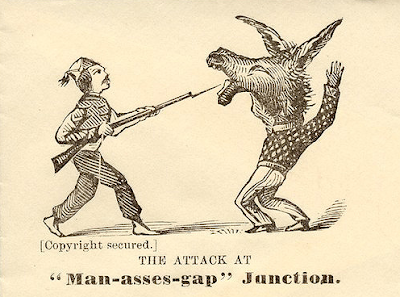 Then battle breaks out. "Battle" consisted of about a dozen and a half red LEDs embedded in the wall blinking at random intervals. Then the underbrush caught fire and an orange wash rose from one side of the room. Then the lights came up again. To recover experience, you need to attempt to approximate experience. At a camporee as a Boy Scout, I remember going into a fire safety RV. We sat in the bedroom as simulated smoke poured into the room, setting off a smoke detector and allowing us to safely see how dropping to the ground and crawling to a window could save our lives. The experience was a safe approximation. A simple smoke machine and some more complex lighting might have gotten the experience just a bit closer to the real. Let the visitor start to feel fear and confusion. Let them feel the distress of a confused soldier. Make realistic muzzle flashes, and not something akin to winking owl's eyes in a carnival haunted house. The battle experience gallery was a relative failure. The next two galleries show white and black civilian experience in wartime. The first is a sparse parlour, the second an equally sparse slave cabin. Using just a few well chosen stories, the exhibit tries to convey the lives of these actors of the past. But where recovering personal experience is the goal of the first gallery, the next two are more akin to simple exhibitry. In addition, the space is cramped and tight, making soaking up the content along with the 9 other people exiting the battle gallery nigh impossible. Interactive computer panels lined the walls in both galleries, but the content did not differ from one screen to another. For so many different sensory inputs, there was very little information. "For the descendent of a soldier, they are places of reverence." "For the scholar, places of learning." "For African-Americans and immigrants, they are places associated with new-found freedom." "To some they are testament to the best and the worst of humanity-the wasting effects of war." Can a white man not feel the power of that new-found freedom? Can an immigrant not feel reverence? Can a scholar not see these places as abominations, symbols of the collapse of the human spirit? Can African-Americans not study these places for the keen excitement of their military tactics? How racist is the thought that just because you look one way or another, you automatically think of a place in a particular way? What benefit does dictating the meanings that people walk away with after encountering the Civil War in the Old Dominion provide? Wouldn't it be far more effective to offer these visitors the opportunity to draw their own personal meanings from the war? Saying to someone, "You must care about this place because of..." is one of the surest ways to alienate them. If you allow them to explore, though, they will develop their own personal meanings for a place. When they invest their own meanings in something, they keep on caring. The video makes the blanket claim that the Civil War was, "an event long ago that remains central to Virginia's identity. What happened in our back yards, in our towns, along our rivers and in our valleys-helped launch the American nation on a path to power and greatness." The last line is cutting in its vapid simplicity: "The union once asunder, now changed, inseparable." What about Reconstruction? What about 100 years of racial segregation? What about the current debate over state or federal supremacy? What about the continued definition and redefinitions of what constitutes a citizen? I know these sound like trite questions, like I am asking the exhibit to cover that which it never intended to. But then I stepped outside and watched a video on a monitor in an adjacent Virginia Civil War 150th Commission tent. Here was the conclusion that SHOULD have been in that last room in a windy, bright tent, barely visible. Covering 1865 to 2011, the video brought the Civil War full circle, showing the rough and winding path forward from the Civil War to today set to the jarring tune of Jimi Hendrix' 1969 performance of the Star-Spangled Banner at Woodstock. I tried to film it as best I could, but the video came out poorly, so I don't have anything to share. When the Virginia Civil War 150th Commission puts the video up on their site, I'll be sure to link you off to it. Still, for a minute, just imagine what could have been possible had the organizers just let everyone draw their own conclusions from the exhibit, instead of dictating the acceptable importances of the Civil War? How many more visitors would find the place they fit within the Civil War? I spend a great deal of my time on the blog preaching (some might call it my soapbox) about the mantra, “Beyond the Battlefield,” and how Civil War battlefield interpretation should go beyond just the tactics used during the battle and military matters. Some have called me crazy, some have told me I am flat out wrong about what visitor’s want, and some have told me that if I talk about these things, I will fail. The problem with all those statements though, is that they imply that I am alone in this ideology. The battlefield of our great fratricidal American war is not merely a place of strategy and tactics: not a place where regiments moved this way and that like checkers on a board; not merely a spot where something was decided that would lead to another decision. It is a place of the thoughts and acts of men, of their ideals and memories; a place where on the evening of a fatal tomorrow men could joke and sing, a place of people, not armies. For we Americans are not descendants of a regiment; we are sprung from men and women. In the places devoted to human history the objective of interpretation remains unchanged: to bring to the eye and understanding of the visitor not just a house, a ruin, or a battlefield, but a house of living people, a prehistoric ruin of real folks, a battlefield where men were only incidentally – even if importantly – in uniform. Written in 1957, those words still ring true today. I recently came across the two quotes in my notes about interpretation. I had written them down, in my own handwriting when I first read Tilden’s book, Interpreting our Heritage. Reading Tilden’s book changed my entire outlook on interpretation and public history. Before reading his book, I was what I like to rail on today, a young public historian who focused on all the nitty-gritty detail, a historian who had to know everything and share with everyone I talked to how much I knew. I’m still that nerd who loves finding arcane tidbits of historical fact about the places I work at and love. But I have changed as well. I realize that Interpretation is not so much about the past, as it is about the present. It is about us today, connecting with the people of the past at places we have found great meaning in. Battlefields are places of people. Battlefields do not belong to those of the past, but to those of us living now. Before I go any further, I need to make something clear: they tried. Oh, they tried so hard. The deck was stacked against them and they gave it the old Harvard try. Heat, a weekday and more... They tried so valiantly. But they came up short. I've been going to Civil War anniversary events at Gettysburg for nearly a decade now. They are always simply buzzing with activity. The visitors start in the wee hours of the morning and have a smorgasbord of opportunities to choose from until sundown. There is never a lack of things to do on July 1st, 2nd and 3rd at Gettysburg. Yesterday I took a day off of work, firmly put on my visitor hat and walked into Manassas expecting much the same thing: buzzing activity from morning until night. What I got was a sparse schedule, full of holes and gaps. The morning began with the grand keynote opening. Baking in the hot sun was fine and planned for. The speeches ranged from adequate (Governor McDonnell) to outstanding (Ed Ayers) to inspiring (Jon Jarvis). The moments were interpretive and meaningful, Ayers especially showing his keen ability to breathe life into the war with a prescient sense of what would work for the varied audience. I am no crowd counting expert, but spread across the hill could not have been more than a regiment's worth of spectators and dignitaries observing the event. The low-turnout ceremony was both streamlined and meaningful right up until the U.S. Army Drill Team emerged at the end of the ceremony. While spectators melted and wilted in the unrelenting sun, the drill team marched slowly and tossed guns in the air. What did spinning rifles have to do with Manassas? akin to the Tomb of the Unknown Soldier? I thought to myself, "What does this REALLY have to do with the Battle of Manassas?" I watched, less than mesmerized. I have deep respect for the 3rd U.S. Infantry's skill. But what did tossing 1903 Springfield muskets have to do with the ground upon which they were standing? It seemed more gratuitous, frivolous entertainment, ala themepark stunt shows, than measured and meaningful commemorative activity. The program ended with taps. That trumped the disjointed spectacle of the gun juggling, but the sour taste still lingered in my mouth. The ceremony ended at 11am. Taking a glance at the schedule, no exhibit or events even would open for another hour. The visitor center's air conditioned haven was set to be shuttered for sixty minutes (it thankfully was opened earlier than scheduled). What was the crowd to do? They boarded the shuttle busses and went back to their cars. They were given no offerings, no direction and no opportunities to engage with the ground beneath their feet. They simply gave up. Within minutes, the majority of the folks standing on Henry House Hill had left. We stuck around, we dedicated and geeky few, and tried to take in the offerings. The pickings were slim. We could wait for an hour in line to buy postal dedications, eat some food from the concession (which also, thankfully, opened early), browse the family exhibit tent or linger for an hour for the first piece of organized interpretation to begin. Where was the bevy of various real-time and exceedingly powerful programming that a simple 148th anniversary at Gettysburg warrants? The crowd visiting the Robinson House site. The most heartbreaking moment for me, though, as a historian of black history, was walking out to the Robinson House site. There was little to entice visitors out on the excruciating walk to the farm site. The weekend's pamphlet said little about the site, the most tantalizingly incomplete being: "Join park rangers and volunteers at the Robinson House site for a glimpse into the life of a free black family at the opening shots of the Civil War." That was enough for me, but only because black history is my bread and butter. The Marine Corps Historical Company's firing demo was much closer and far more showy. I walked alone to the Robinson House while the majority of visitors wandered aimlessly looking for something, anything to do. I was the only visitor at the site. The only visitor on the right flank of the Confederate line on the 150th anniversary of the battle of Manassas at the exact moment that line was aflame with musketry. There was one interpreter beneath a small awning, Ranger Lindsey Bestebreurtje. She was patient, kind and exceedingly knowledgeable. She answered all of my questions and made a real interpretive connection between the ground and the ideas. She was the highlight of the day. But I was the only one who met her, at least for the half-hour I was out on that knoll. I'd doubt many people had the chance to feel the power of that ground, to feel the heartache of the Robinson family as two of their sons were sold South to slavery. As Mr. Robinson hid beneath a low bridge with Federal and rebel forces streaming back and forth around his farmstead, waiting for battle to subside. As one of those young sons lost walked from the gulf coast to Manassas on hearing about the Emancipation Proclamation. Walked. Meanwhile, earlier in the day, some of the descendents of the Robinsons recited the pledge of allegiance. They were introduced quite flatly, with no background as to who their ancestor was or the struggles his family went on to overcome, becoming one of the most prosperous black families in Prince William County. They were introduced by name, read the pledge and sat. I had to seek out that story. I had to hunt it down. Without Ranger Lindsey's help, it would have remained buried. In the end, I understand it's easy to criticize from a keyboard while sporting a killer sunburn. But serious work deserves serious criticism. We all want the next event, and the next event after that, to be better and more meaningful than the last to a wider and wider audience. These critical posts aren't written with a wrecking ball impulse. Instead, it's more pruning shears, pointing to which buds might be clipped to make the prize winning rose bush even more tantalizing. I have so much more to share about the day, but that will come as the weeks progress. The HistoryMobile is high on my list of things to discuss, have no worry. There were amazing moments and not so great moments throughout the day. I had only hoped for a larger buffet from which to choose. Too often, we came back with empty plates when we wanted to really begin to understand that important place. A few weeks ago, the Hanover Evening Sun ran an article on the Lincoln Cemetery in Gettysburg and the locks which hang on its gates. This is by no means a new item of interest. The locks have girded the gates of the cemetery for three years. Still, the article (no longer on the Evening Sun's website but archived here in a PDF) raises a few interesting questions about the delicate balance between preservation and interpretation. The caretaker of the cemetery told the Sun that when the cemetery was, "opened to the public," that the, "heavy traffic and lack of discipline and respect has caused graves to sink and stones to be pushed over." The lock went on the gates. Now only those with a, "sincere interest," are allowed to tread into the hallowed ground. 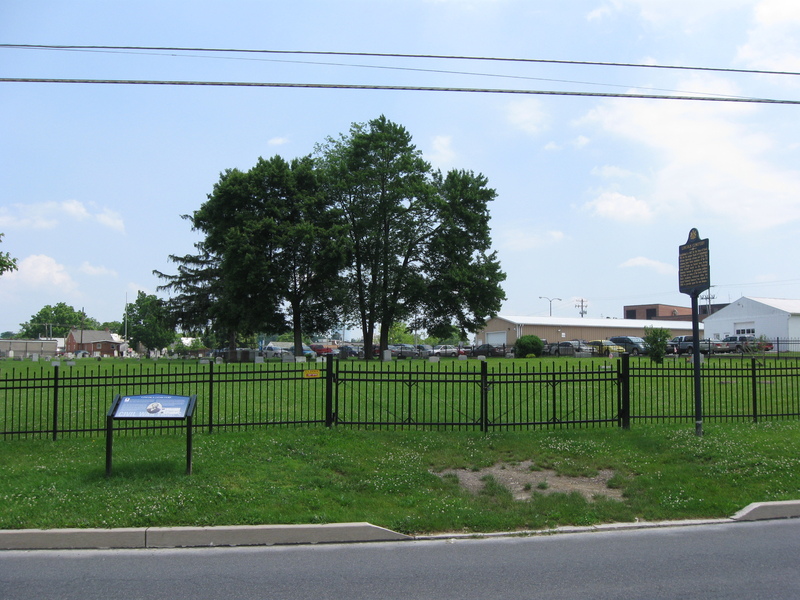 Lincoln Cemetery is the descendent of the original Good Will Cemetery, which served as a burial plot for the county's United States Colored Troops who were denied burial at the Soldier's National Cemetery just a stone's throw away. The history of the small plot is integrally linked with the story of freedom and the meaning and legacy of the Civil War. It is perhaps the most important ground in Gettysburg to visit when you are trying to unravel the legacy of war and the impacts of the conflict on America's black community. But it's tough to visit the ground. A lock stands in the way. The caretaker asked the rhetorical question in May: "We have to decide, do we preserve the history that reflects the black citizen?... Or do we leave it open to be vandalized and trampled?" I understand the struggle to restore a cemetery. A cemetery restoration, involving resetting more than 20 stones, was my Eagle Scout project. But the reason you restore any landscape is two-fold. You want to preserve the place, but to a specific end: enjoyment and appreciation. I wanted people to see Blocktown Cemetery and appreciate it. I wanted people driving by to wonder, "What is that?" and stop for a stroll through the area. I know, someday, Thankful Olcott's tombstone will tumble forward again. And I have faith that another historian or Scout will come along and fix it so another generation can enjoy it once again. That's how preservation works. Is destruction really all that leaving the graveyard open will accomplish? Is vandalism and trampling the only outcome of the locks being left off the gates? Couldn't leaving the graveyard open to visitors to wander between the stones also help to foster a new found appreciation for the men and women buried there and their struggles? Visitors are supposed to show a, "sincere interest," in black history before they can enter the sainted ground. But how do you develop that interest when the majority of black history in Gettysburg has been effaced from the landscape? Slivers and nuggets still exist here and there, but the majority of the African-American story in the town has been wiped clean from the slate with the concerted focus on three days in July. This is absolutely wrong. The story of Gettysburg's black community, a community which has remained more-or-less intact within the Third Ward for over 150 years, begs to be told to every succeeding generation. Lincoln Cemetery's Civil War Trails marker. Lincoln Cemetery is the chief tangible reminder we have on the landscape that a black community existed in Gettysburg in the 19th century. The home of Jack Hopkins, prominent member of the black community in 1863, crumbles to dust on Washington Street. The photos of Mag Palm, holding her hands defiantly for the photographer just as they had been tied by men trying to drag her south to slavery, appears in numerous places around the town; her photo often goes conspicuously uncaptioned. Basil Biggs' integral role in reburying the union dead after the battle, the men who had died to ensure his freedom and the payment for whose burial he would use to build a new and prosperous life, is a miniscule footnote if mentioned at all. Where else can a casual visitor, who might not have a, "sincere interest," when they walk in through the gate gain that interest before walking back out? I understand that, just like the African American Civil War Museum, it is the prerogative of the cemetery to do as they wish with their property. But how productive is that lock? How damaging will that $200 price tag end up being for the AACWM? Isn't it imperative that the Civil War story of the Americans of African descent be told to ever broader audiences? Don't we need to win converts to the fold of black history and not simply preach to the choir again and again? 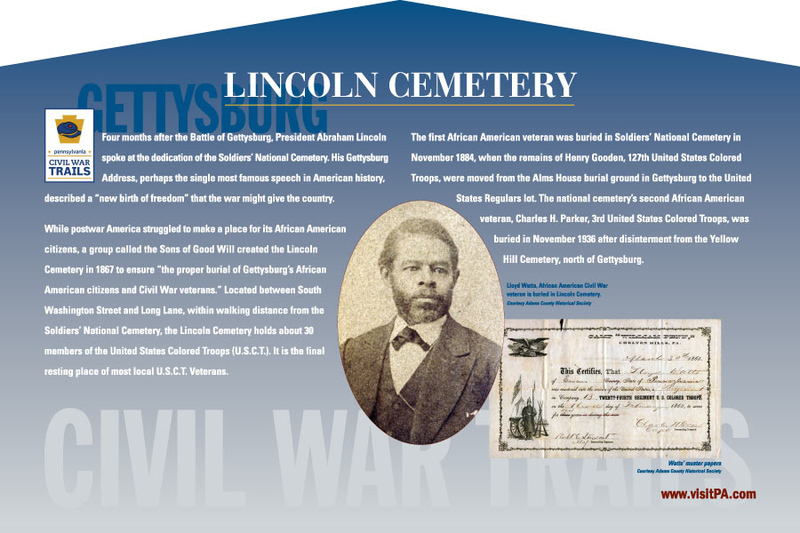 Lincoln Cemetery was, "restored to preserve the only concrete history of the colored troops," in Gettysburg. At the Memorial Day celebration held in the cemetery, my pastor and friend Rev. Joseph Donella gave the keynote address. In part he said that the black community's, "dead heroes belong to the whole nation. What they suffered in life and death, then, needs to serve as our reminder. Let us not look to the past, to recapture hostilities and wayward sins. Let us remember, what they dared not forget, our dignity is preserved by collaboration in community." Wandering thoughtfully among those stones is the best reminder any of us might find. A couple months ago, at the annual spring Gettysburg antique show, I found a small display of Civilian Conservation Corps items. Pennants and coins, matchbook covers and pins all displayed on a piece of foam-core. One caught my eye. For $10, I became the proud owner of a matchbook cover, never used, from a CCC Camp in Gettysburg. Company 1355 was stationed at Camp NP - 2 - Pa., now known as the Boy Scout / youth camping area at McMillan woods. I was thrilled. The piece is an interesting artifact, but nothing too curious. There are artifacts from the CCC across America, from roads and public works projects to family photo albums and mementos ferreted away in attics as reminders of America's last great economic troubles. This matchbook is not necessarily odd. Until you realize a key fact about Company 1355: the men were members of one of the Civilian Conservation Corp's all black units. These men were stationed at Gettysburg, Lincoln's home of a, "new birth of freedom." The decision seems not to have been made lightly. Its meanings were readily apparent to the region's African-American community. 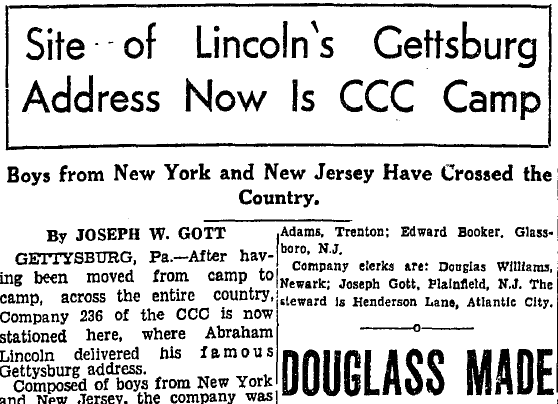 When a previous CCC company was stationed at Gettysburg, the Baltimore Afro-American was keen to point out that CCC men were now working, "where Abraham Lincoln delivered his famous Gettysburg address." 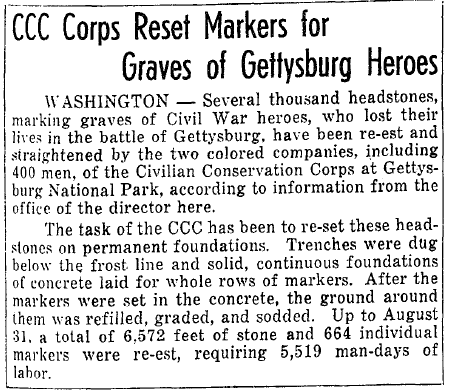 The men of camp 1355 were part of the work crew which reset, "several thousand headstones," in the National Cemetery in 1935. The Afro-American declared the soldiers who rested there as, "Civil War heroes." Working in the cemetery, undoubtedly, in between good-natured jests which workers trade on long days, the men of 1935 must have thought about those men of 1863 who were buried there, Lincoln's, "honored dead." They must have thought about their lives as black men in an America whose future was uncertain. Did they gain strength to journey on from the soldiers' willingness to die for the future of a race of men? Can we still gain that strength for our lives today?